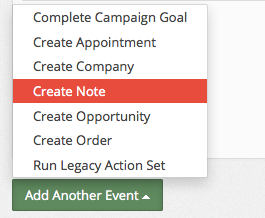 Select Create Note from the Add Another Event dropdown menu. You can either use an extracted field to create the title, or manually set the value and have it be the same every time. As with above, you can either use an extracted field to create the type, or manually set the value and have it be the same every time. Broken Record Alert! You can either use an extracted field to create the description, or manually set the value and have it be the same every time. Review the changes that you have made. Once you are satisfied, click Save Note. You're done!